Dmitry Medvedev presented state decorations to foreign citizens for their contribution to strengthening friendship, cooperation and cultural ties with Russia. 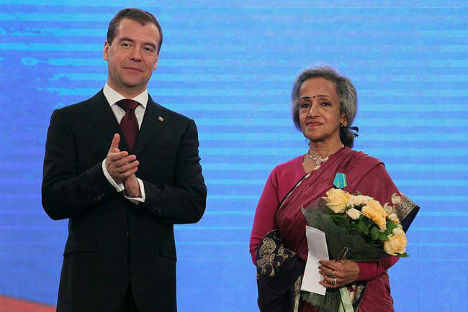 Indian writer, publicist and playwright Achala Moulik received the Pushkin Medal. Achala Moulik, born 1941, for many years has occupied important governmental and public posts in both Karnataka and Union ministries and institutions. She rightfully belongs to the country’s intellectual and academic elite. Recently, after retiring from government service, she has actively engaged herself in literature and dramatics. Achala Moulik is the author of more than 20 books on culture, art and architectural monuments as well as Indian and foreign literature and paintings. Since 1976, when “Silhouettes of Russian Literature”, Moulik’s first book dedicated to the treasures of the Russian literature, came from printing, the author has been continuously and fruitfully working on this topic. The play, staged after her “Pushkin’s Last Poem” made a successful debut in Moscow and Saint-Petersburg within the Year of India in Russia in October 2009. September 2010 saw Achala Moulik’s fundamental research “Tolstoy’s Century in the Indian Perspective”. She authored many articles on Russian history and culture, widely published all over India. In 2010-11 Achala Moulik wrote a new work “Rabindranath Tagore: The Man Under Whom the Time Had No Commanded”, which was triumphantly presented in August this year in New Delhi and her native town of Bangalore (Karnataka) timed to celebrations of the 150th anniversary of the India’s outstanding poet and writer. The book’s separate chapter focuses upon a comprehensive and objective historical and literary analysis of Tagore’s “Letters from Russia”, based on the author’s scrupulous work with its original texts in Bengali. This important Tagore’s stage of life also found its reflection in several articles published by Achala Moulik in the Indian press. The solemn Award Ceremony traditionally timed to the Day of People’s Unity was held in Nizhniy Novgorod on November 4, 2011. Achala Moulik was invited to participate in the event along with other foreign laureates and guests.